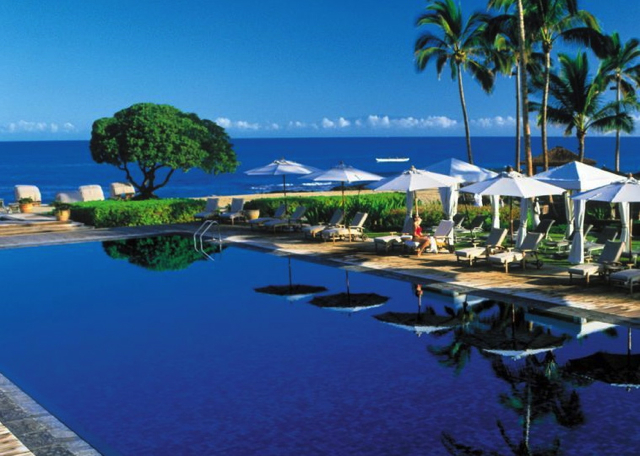 HomeTravel TipsHoneymoon in Hawaii: Which Island and Which Hotels? Plan well ahead if you're trying to book domestic first class awards to Hawaii. If you're coming from the East Coast, consider flying a flat bed on United to California then either a cheap coach ticket or coach award using 25K Avios for West Coast to Hawaii. Consider splitting time between a couple of different resorts, depending on how much you plan to be at the resort during the day. It may not be worth spending hundreds of dollars per night on a room or suite if you'll be on outdoor adventures the whole day, though on resort-focused days the extra luxury can be priceless. After all, it will (hopefully) be the only honeymoon of your life. Why #1: Your honeymoon is the start of a lifelong adventure together, and in my view, the Big Island offers the best and most diverse adventures of all the Hawaiian islands. Where else can you go from seeing an active volcano to snow-capped Mauna Kea, with its astronomical observatories? Or visit black and even green sand beaches? Or see the best preserved Hawaiian petroglyphs? Since this reader mentioned snorkeling, there's also snorkeling and diving with manta rays and often dolphin sightings. If you don't intend to go off the resort at all, there's of course less reason to choose the Big Island, but for anyone who is keen to have some active outdoor adventure, the Big Island is an excellent choice. The Four Seasons Hualalai: Consistently regarded as one of the very best Four Seasons worldwide, the Four Seasons Hualalai is much more expensive than any other option on the Big Island, but worth it for a honeymoon or splurge trip. The nice thing about this property is that, even though it is very child and family-friendly, there is an adults only pool which is perfect for honeymooners. The gorgeous grounds are extensive enough that even when the resort is full or nearly so, it usually doesn't seem that way. Tip: Make reservations for restaurants, spa, etc. well in advance. Contact TravelSort if you'd like to book this hotel. Why #2: Kauai is one of the oldest islands, which means a couple of things: some of the finest beaches (since there's been time to weather the sand make it much finer and softer, than, say, the Big Island) and very dramatic topography, with its chiseled cliffs. It's a smaller island, so it doesn't have the built up nature and traffic jams of Maui, and that, at least to me, also makes it more romantic and less touristy. Don't miss a helicopter tour of the island, and, if you're the active type, there's plenty of great hiking.Hanakapi'ai Falls is lovely, though make sure to have the better part of the day for it so you can take the time to enjoy the panoramic views. 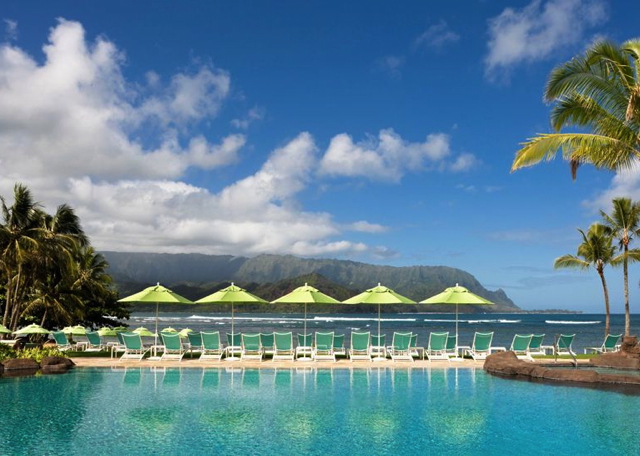 St. Regis Princeville: Don't expect Four Seasons standards here, but the beautiful views of the Napali coast, gorgeous sunsets and secluded nature of the resort almost make up for it. Yes, it's Princeville, so there's more chance of some rain showers, but that also means some picture perfect rainbows when the sun emerges. The nearby town of Hanalei is a good bet for more reasonably priced local dining and vintage finds at Yellowfish Trading Co.
Why #3: There's a reason why Bill Gates opted to make this entire island his, for his honeymoon. The two main properties here are both Four Seasons, and since it's the smallest publicly accessible inhabited Hawaiian island, it draws many fewer visitors and more couples rather than families. Some of the highlights of a visit to Lanai include the chance to see spinner dolphins, riding horses at Koele, the Mike Carrol art gallery in Lanai City, and a long walk at beautiful Polihua Beach, which is usually deserted (though you'll need a 4×4 to access it, and don't go swimming there due to riptides). Four Seasons Lanai at Manele Bay: If you want ocean views, this is your place–you may even be lucky enough to spot a pod of spinner dolphins from your terrace. The pool here is a lot less crowded than at the Four Seasons Wailea, and in general you can simply feel yourself relax. Try yoga on the beach in the morning, perhaps some snorkeling or relaxing poolside in the afternoon, and for a change of scenery, take the shuttle up to the Four Seasons Koele Lodge or into Lanai City. Contact TravelSort if you'd like to book this hotel. Four Seasons Lanai at Koele Lodge: The Lodge at Koele was an incredibly unique property even before its acquisition by Four Seasons. It has retained its look and feel of an English country estate, complete with croquet courts, lawn bowling, tennis courts, and an 18 hole miniature golf course. Try horseback riding, or rent a bike for a longer excursion around the island. Don't forget a warm sweater or two, since it is cooler up at the Lodge. Contact TravelSort if you'd like to book this hotel. Four Seasons Wailea: We enjoyed our stay here and in general service is friendly and top-notch, but I wouldn't say it's one of the best Four Seasons for honeymooners; if anything, it's probably better for families. While there is an adults-only Serenity Pool, it tends to be packed, with people “reserving” lounge chairs by 7am or so. And the main pool is often busy with kids. Poolside service is typically excellent, however, with complimentary ice water, fruit, sunglasses cleaning, etc. Note that some “Mountainside” View rooms actually overlook the parking lot, so it's worth it to at least book a Garden View or Partial Ocean View Room and request an upgrade if available, given that it's your honeymoon. Fairmont Kea Lani: While not the Four Seasons, the Fairmont Kea Lani enjoys a similarly nice beach (if anything, it's often less crowded) and in my view is a better value, given the substantial price difference and the fact that the Four Seasons Wailea is often so packed anyway. The rooms are very comfortable if a bit dated, but the grounds and ocean views are lovely. 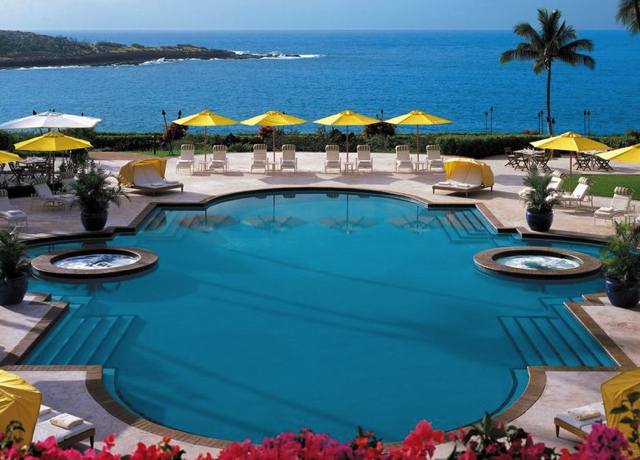 Ritz-Carlton Kapalua: While Kapalua doesn't have as much consistent sun as Wailea and is windier, the Ritz-Carlton tends to be less crowded than the Wailea resorts and more conducive to a honeymoon if you want more seclusion. Enjoy some great hiking, kayaking and snorkeling, and if you want a calmer beach, there's a hotel shuttle to one. For a honeymoon or splurge trip, I'd recommend booking the Club Level. If you've honeymooned in Hawaii or plan to, which islands and hotels are your favorites?